Lush Fab Glam Inspired Lifestyle For The Modern Woman: Sneak Peek Inside RHOA Nene Leakes﻿ Wedding! 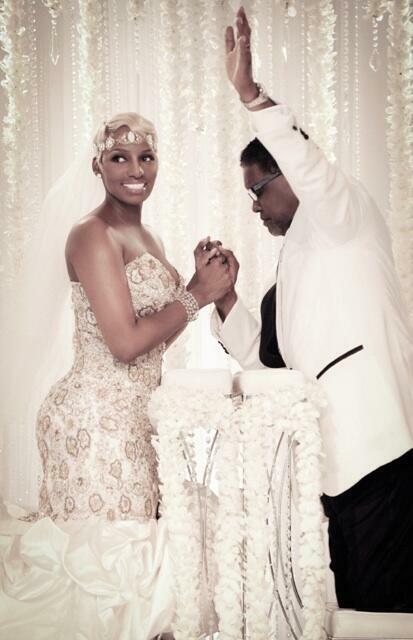 Sneak Peek Inside RHOA Nene Leakes﻿ Wedding! 'Real Housewives Of Atlanta' reality TV star Nene Leakes walked down the aisle for the second time with her husband Greg Leakes, in a $1.8 millon wedding over the weekend. 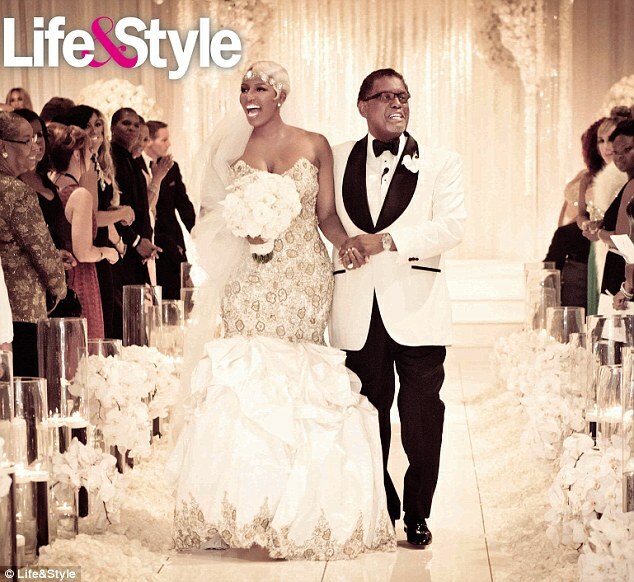 Life & Style magazine has released the first exclusive photos of the couple's ceremony, guests and Nene's sparkling white and gold $50,000 strapless Barracci wedding dress and the 'Great Gatsby' inspired headpiece she wore instead of a veil. On the magazine cover Nene is seen wearing her new 10-carat diamond wedding band and it is reported that she changed into a $20,000 off-white Pnina Tornai gown embellished with Swarovski Crystals for the reception. 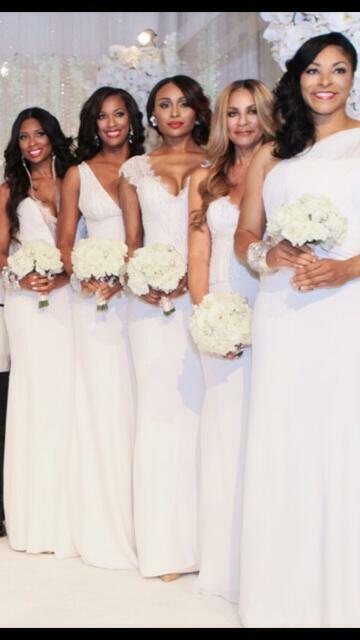 Nene's bridesmaids which included RHOA star Cynthia Bailey also wore white gowns by Gabriella Arango. Nene decided on the Old Hollywood theme and intricate details of her wedding like the custom 10-tier vanilla cream cake and 3 foot floral table centerpieces with the help of planner Tony Conway. The complete wedding and reception will be shown in Nene's new spin off show 'I Dream of NeNe: The Wedding' which will air on Bravo this fall. The Bridesmaids in white gowns by Gabriella Arango. Real Housewives of Miami's Marysol Patton with Orange County star Gretchen Rossi. 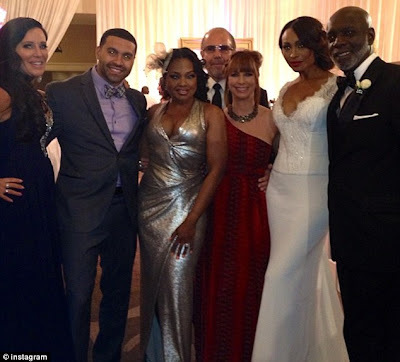 Millionaire Matchmaker's Patti Stanger, and Real Housewives stars Apollo Nida, Phaedra Parks, Jill and Robert Zarin, Cynthia Bailey and Peter Thomas. For more photos of Nene's wedding and reception see the current issue of Life & Style magazine. What do you think of Nene's wedding dress and all white ceremony decor? Leave a comment below. That is such a great dress. I have been looking at wedding dresses in NJ trying to find the perfect dress. I can't wait until I find it. :-) Good luck with your dress search Lauren!